Together we celebrate Volume 70 of our journal in 2019! Find more information in our history of German Journal of Sports Medicine. German Journal of Sports Medicine accepts submissions of a wide range of article types, including original research, education articles and systematic reviews. At "Authors" a lot of detailed information is suitable for donwload to help you publish an article. 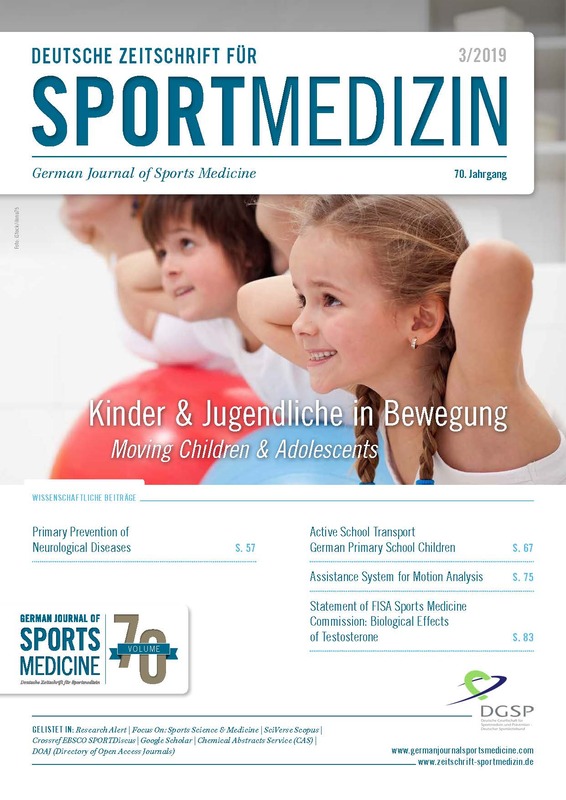 The German Journal of Sports Medicine <Deutsche Zeitschrift für Sportmedizin> is an Open Access Journal according to the standards of the Directory of Open Access Journals (DOAJ). The scientific part of the Journal contains current and previous scientific articles in HTML and PDF-format, a fully indexed archive until 1999, a full text search tool. The references can be downloaded in current citation manager formats. All articles are indexed in main journal data bases. This is the traditional internet address of the Journal and is the new online magazine in German language. You will find there researched articles on current topics in the entire field of clinical sports medicine and preventive medicine as well as current research results and opinions - also in related fields -, reviews of the scientific articles of the Journal, contents of our cooperation partners and announcements of the Journal. As of issue 1/2018, in all scientific articles American English will be declared as main language. The reviewing process can still be done in German language; all German-speaking articles need to be translated before publication by the authors. We will support young authors with this translation. Extended Abstracts will still be published in German. With this procedure we aim to be listed in international databases.